The fourth week of pregnancy is when the first visible changes occur. During week 4, the embryonic disc takes on a more cylindrical shape and the neural tube, the precursor to the central nervous system develops. This neural tube is simply a tube that lays the foundation for the entire central nervous system. Mothers won’t have to worry about weight gain yet, but they should be mindful of their dietary intake. This is the first week that many major organs start to form and all of them are vulnerable during this week of pregnancy. Most mothers won’t begin to gain weight until later in the pregnancy, with multiples being the exception. This will most likely be the first week that the mother realizes she is pregnant. Four weeks is usually the amount of time needed for the menstrual cycle to start again, and most women will find that the lack of a menstrual cycle will be their first indication of pregnancy. However, many women could be alerted to the pregnancy by the mood changes, hormone changes, and the other various signs of pregnancy. What Can Be Seen on the Ultrasound? When the mother goes for their four week ultrasound, the technician might find it hard to measure fetal size. It’s not impossible at this stage, but it is difficult to determine the size of the baby. 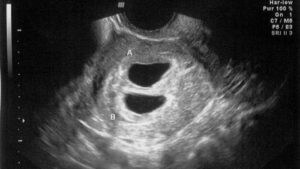 During the four week ultrasound, the gestational sac can be seen. The gestational sac is the clear sac that protects the baby until the placenta can form. During this visit, the doctor should be able to confirm a successful implantation and rule out an ectopic pregnancy. An ectopic pregnancy happens outside the uterus. Ectopic pregnancy is dangerous, an embryo cannot live outside of the uterus. Pregnancies that transpire out of the uterus cause major health concerns and compromise the neighboring organs. During the 4th week, the jaw forms. In addition, the head starts to slowly become rounder, a process that will continue for the next few weeks. The heart starts beating and is able to push blood through the tiny blood vessels that the embryo has developed. While it might not show up on an ultrasound, at four weeks little buds start to form that will continue to elongate into arms and legs during further development. Week 4 starts the development of the reproductive system, a system that develops up until a few weeks prior to birth. Week 4 baby isn’t any bigger than a poppy seed. However, major organ systems are starting to develop. The heart is beating and pushing blood through the circulatory system. It is important during this time for mothers to choose the doctor that they want to see them through the pregnancy. Building a trusting relationship with your obstetrician is important for any pregnancy. The mother should be able to trust her doctor’s medical opinion and confide in them about their concerns, without feeling ashamed or embarrassed.